When the cat (Momobari) is away, the mice (the student council second-years) will play. 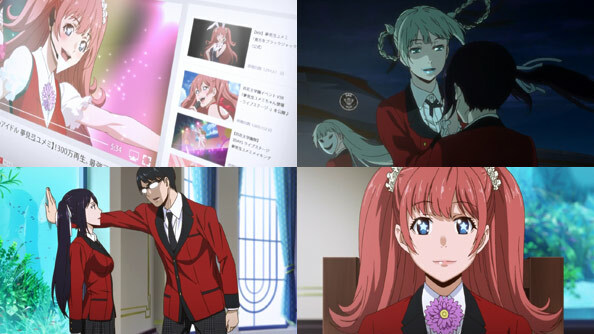 The latest member to set her sights on Yumeko is Yumemite Yumemi, who despite having a tongue-twister of a name is the school’s unofficial idol, already viral on YourTube and with a loyal army of fans. Meanwhile, the rumors flying of Yumeko retaining her livestock status so she can challenge the presdient, Sumeragi approaches her, and after pretending to play innocent, she later fesses up to wanting a position in the council back, once Yumeko takes over. We also quickly learn Yumemi is another two-face; with probably the greatest difference between her public and private personas. While she’s open and hands on with her sweaty fans, she secretly despises them, flashing horrific faces twisted in disgust. But she accepts the discomfort as the price of attaining her goals. When Yumeko and Yumemi finally meet, they don’t play nice for long, as Yumeko is pretty aware of Yumemi’s disdain for her fans. The facade drops, and Yumeko manages to provoke Yumemi into an anti-fan tirade that she secretly records on a device she hid in Yumemi’s assistant. 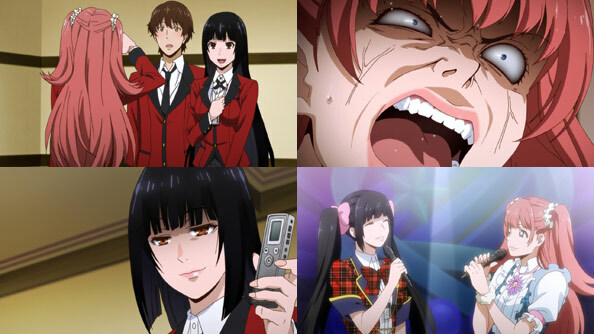 The gamble in question seems to be a battle of idols, with Yumeko having to join Yumemi’s idol group and live the life of an idol if she loses, while Yumemi, confident Yumeko is underestimating her, agrees that if she loses the incriminating audio will be distributed and ruin her idol career in its infancy. The details on how this particular idol-themed gamble will be laid out and scored remains a mystery, but there’s not doubt that whatever happens, Yumeko’s star will only rise with this new, very public opportunity. We also learn Ryouta is a big fan of Yumemi’s, but I assume he’ll be rooting for Yumeko as the two square off.